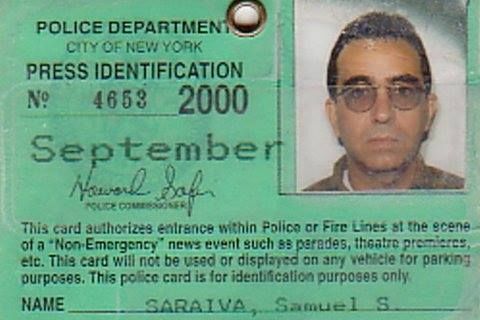 Samuel Saraiva, was actively involved in Donald Trump's campaign for President since the start of the Republican primaries in early 2015. He took part in rallies in Maryland, Virginia, Pennsylvania and in Washington, DC as well as being present during a victory party on November 9th, 2016 when Hillary Clinton conceded the win to Trump. 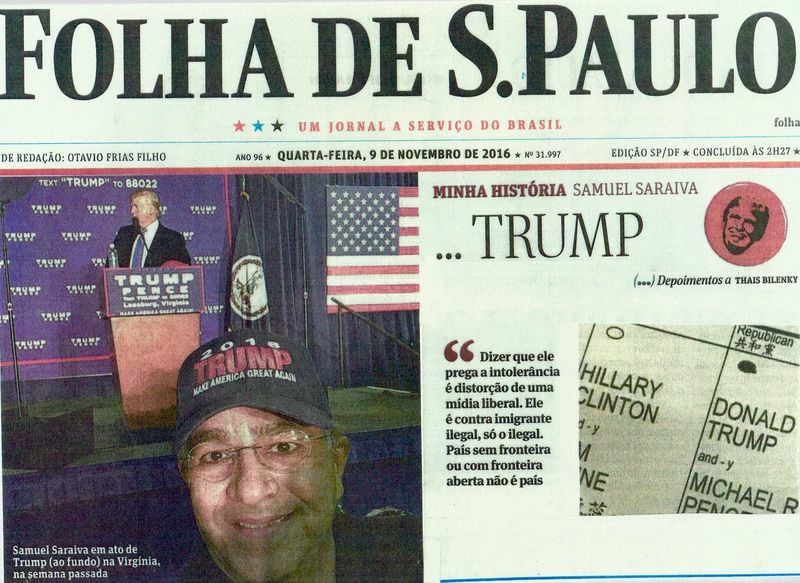 Going against the tide of most Brazilian journalists who tried to influence Latin americans to support Hillary Clinton, Saraiva voted for Trump for the reasons that he detailed in an interview published on November 9, 2016 with one of Brazil's top print publications, Folha de Sao Paulo. 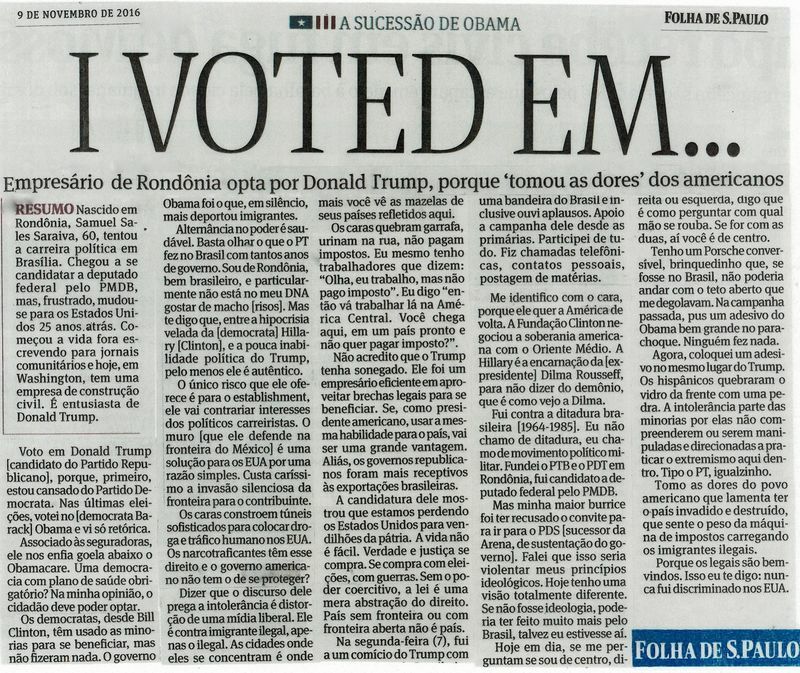 The article was titled (translated from Portuguese), "Brazilian businessman votes for Trump because he feels the pain of the US" and was done by Thais Bilenky. 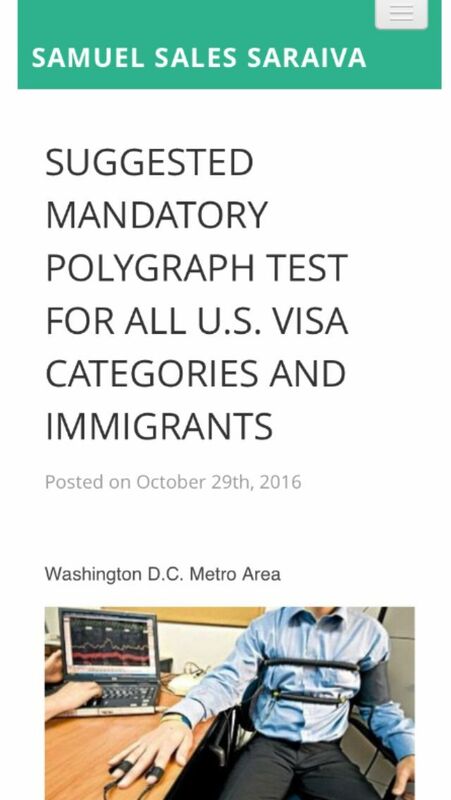 As an enthusiastic defender of Donald Trump's ideas, Saraiva now urges the President-elect to consider the mandatory use of polygraph tests for all visa applications at American consulates around the world as well as for any type of residency application done within the United States. He feels it's imperative that we test the "friendliness" of all those who want to visit or live within US borders and to understand who has a criminal past or, simply, criminal intentions with their activities in America, even regarding simple actions like the desire to pay taxes. Finally, it should be noted that Samuel Saraiva is one of Hillary Clinton's "deplorables," who helped make up an electoral college majority to elect Donald Trump into the White House.